Valentines is just around the corner & nothin' says lovein' like an Amy Glasscock original painting! *** My paintings, including this piece, are currently on display in Austin, Texas. *** Congrats to Mr. Rob Ancipink of Long Island NY, the newest owner of an Amy Glasscock original painting! Click here for details. 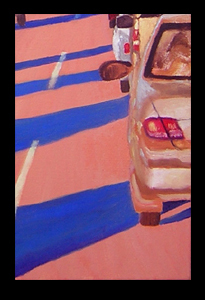 The idea for this painting was born in rush hour traffic in Austin, TX, as I waited to cross the 360 bridge. The shadows of both the cars and the bridge were what captured my attention at first. However, as I thought about making this into a painting I really started to think about the idea of waiting and the idea of a bridge as a symbol. I came across this website called How Stuff Works and I was reading about how bridges work. In the online article, it said something like "bridges are made to help people overcome obstacles, whether they are rivers, valleys, or even railroad tracks." 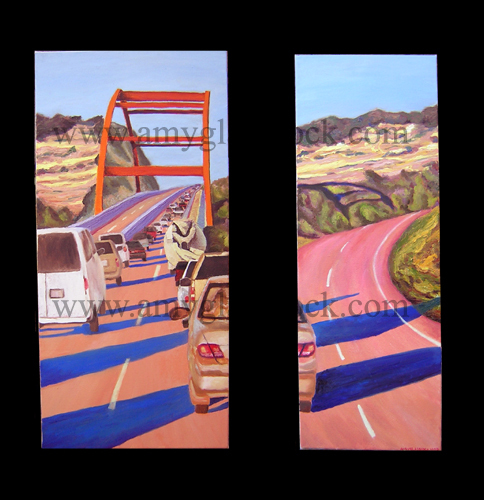 So, the concept of a bridge being a physical symbol of overcoming an obstacle was appealing to me as I thought more about how the idea of waiting and looking forward to overcoming applies to both the subject of the painting and my life. The painting depicts a line of stopped traffic. The viewer is thrust into the driver's seat: waiting, stewing, wondering when they will get over the bridge. There is a way out of this imperfect situation. A road to the right beckons the driver to take a chance, as the downhill slope makes the road quickly disappear. What seems like a perfect way out of this traffic mess will ultimately lead to nowhere as the bridge is the only way over the unseen obstacle ahead. Never-the-less the temptation to give it a try is very real as the line ahead seems endless. The viewer can see the obstacle ahead and knows that it will eventually be overcome. The driver also knows that s/he is going somewhere, s/he just doesn't know how quickly, they just know that eventually they will get where they need to be, a place that is not yet visible. Furthermore, the driver has no control over the situation. S/he just has to sit there and wait, however, it is ultimately his/her choice whether they get upset or just enjoy the wonderful shadows and landscape view. Ultimately the driver will get there in the same amount of time either way. To me this is a parallel to the lessons that God has recently taught me about having patience. The road is like the timeline of my life. I am the driver. The horizon is my future. My expectations of how quickly things should happen in my life are sometimes unexpectedly altered because God has a different timetable for my life. I believe in making us wait, God teaches us to have faith that He will provide a way to overcome all the obstacles that lie ahead. Like in this painting we can only see a limited distance ahead, but God can see everything. Our role is to trust that God will get us to where we need to be, and not get upset when we don't get there when we want to. In waiting I have learned that the best way to get through uncertainty is to trust that God is in control. So that is what I thought about while making this painting and even if you don't get all of that out of it the good news is that it has a double meaning! It is also simply about living in Austin, Texas, where rush hour traffic is a way of life. to the one who seeks him; it is good to wait quietly for the salvation of the LORD. "